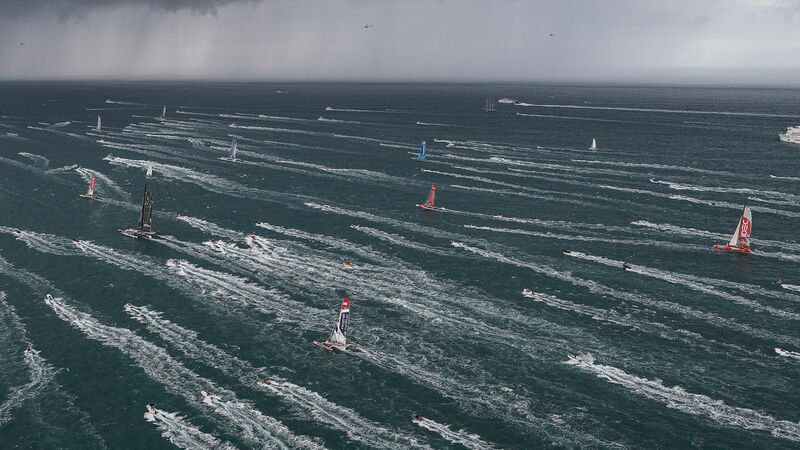 The start, always a very intense time, for both the spectators but also for the sailors who are living their dream! Will Gabart succeed in adding the Rhum to his track record with his Ultim? The competition in this class will be particularly ferocious! Who’s going to succeed Loïck Peyron, winner of the Route du Rhum 2014? All hands on deck! Jean-Pierre is doing a lot of training to be fit and in good shape for the day of departure. And knowing this sailor, he will be! The 4X is totally standard and the layout is traditional. Jean-Pierre will be enjoying optimum comfort for his Rhum! Set a westerly course! Destination: Guadeloupe! The organizers of the Route du Rhum have finally recognized the importance of multihulls of a size and budget which suits the ordinary sailor, by increasing the number of entries to 20 instead of the 10 initially planned in the Rhum class... A class that Multihulls World is particularly excited to follow this year! There are of course the 5 Ultims, the 6 Multi50s, the 24 Imocas (! ), the 50 Class 40s (!) and the 17 Rhum Class monohulls, each with their own beautiful story and often a collective one, and hopefully allowing everyone to realize their dream. But I take my hat off to all the multihulls taking part. The extravagant Ultims (obviously) with their demonic power, grace, agility and exclusivity; The Multi50s who have abandoned their older brothers who aren’t equipped with newly-allowed one-design foils and are trying to conquer the space left vacant by the dazzling and dangerous Ormas. These beautiful 50 footers are machines that deserve developing to the height of their potential. They are almost financially attainable and do not require an entire racing team to accompany them, yet they generate strong emotions for both their crews and race spectators ashore. On the occasion of this 40th anniversary edition, we must salute the 20 multihulls in the Rhum Multi class, especially the 8 Golden Oldies over 25 years of age... and throw your caps in the air in honor of the 5 venerable craft which competed in editions of the 1980s, namely: Sterec-Aile Bleue with Christophe Bogrand, which took part in 1982 under the name of CGA-Gigi by Yves Gallot Lavallée (a Newick Creative 42 built by Le Jelloux); the A Capella Bilfot (formerly Phil Stegall’s Friends and Lovers belonging to Jean Paul Froc, built by Greene / Stegall) who will celebrate her 4th start in the Route du Rhum in the hands of Thierry Duprey du Vorsent; Acapella-Soreal by Charlie Capelle is raising the bar with a 5th participation (ex-Telegram of Brest, built by Walter and Joan Greene); Happy will start with Loïck Peyron on board (winner of the 2014 edition) in her second participation in the event. She is the former A Capella of W.Greene built after the loss of Olympus, the legendary winner of the ‘98 Rhum! Three sisterships in original collectors’ condition out of the four survivors of this event (Humdinger is in the USA)! Pir2, one of the first foiling trimarans (Sylvestre Langevin ex-Lessive St Marc by Denis Gliksman) will be there too, counting the same number of participations as Acapella, including two with Étienne Hochedé, (1990-1994-1998-2014-2018). Olmix (formerly Crêpes Whaou 1) will start with Pierre Antoine: this is a star boat among the Multi 50s which won everything before the appearance of 2nd generation prototypes and has just entered the category Golden Oldies (over 25 years old). Resadia-M'Pulse (Cabon / Capelle) will cross the line for the second time in a row in the hands of Pierrick Tollemer, his challenge being to improve on his 2014 time while preserving this beautiful epoxy wood composite boat (sandwich hulls). Franck Sainte Marie will sail Roger Langevin's Branec IV (ex Dupon Duran II in this seemingly endless list). But be careful, this is one of the three Seatec Formula boats built by Mike Birch’s team on Irens plans - solid, seaworthy and fast in all weathers!